Nous sommes très fiers d’être en mesure d’annoncer un plateau assez exceptionnel pour cette seconde compilation Mind Riot Music. Autour des valeurs sûres du label, Chinese Robots, Moslyve et Lys last Stand, se succèderont les anglais de Burning Alms, les parisiens de Teach Kids Manners et le groupe cosmopolite Love Supreme Dissidents (Chicago, Paris, Sydney). Et pour vous plonger dans l’univers de la compilation il y a Tumblr. We are more than happy to be able to announce the amazing line-up for Mind Riot Music second compilation. 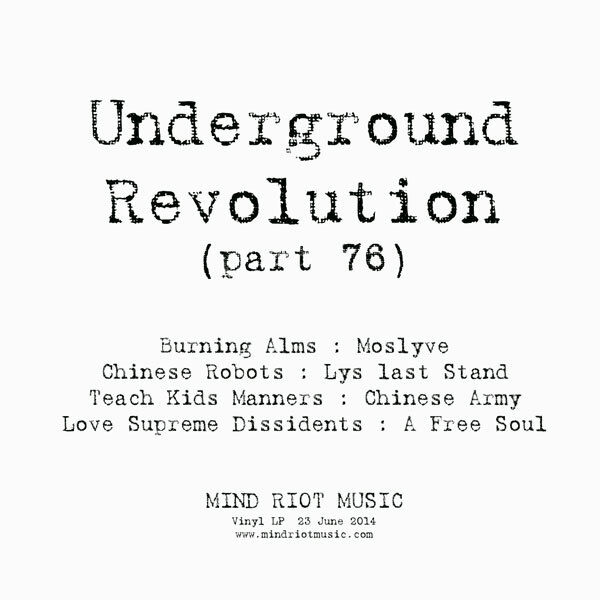 With the label bands Chinese Robots, Moslyve and Lys last Stand, the awesome english band Burning Alms, the parisian band Teach Kids Manners as well as the multi-country band Love Supreme Dissidents (Chicago, Paris, Sydney).